This species is widely distributed but is never abundant at any particular site, often occurring as single individuals. It has been extirpated from certain parts of the outer edges of its range and although still fairly common, recently it has experienced some decline in several areas. Comments: The elktoe is a beautifully marked, relatively thin-shelled mussel with narrow rays and spots on a background of bright, yellowish-green. 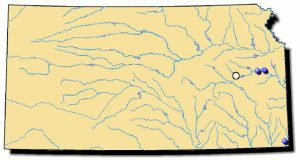 It typically lives in swift, flowing riffles with stable gravel or gravel-sand substrates. Freshwater mussels have an extendible foot used for locomotion. In the elktoe, it is orange and elongated. 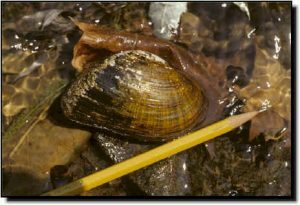 Although rare, this mussel is found in the Spring and Marais des Cygnes rivers.